When you are young, scrappy, and hungry, there’s not much you won’t do to get on top. Starting a new company is not easy, and it’s infinitely harder when you have Lucious Lyon gunning for you. Cookie knows this, and she’s crafty enough and works hard enough to make it happen. But are Andre and Hakeem willing to do what it takes to make something out of nothing when they’ve had everything their whole life? Out of the four of them (if you count Anika, which Cookie does not), Cookie is the only one who really knows what it means to start out with nothing, sweeping your own empty floor and imagining something better. Lucious was right there with her the first time they started a company, and it's part of why he's still so scrappy and crafty, even when he's locked up. However, no one is thirstier for success than Thirsty himself. Lucious' new lawyer proved himself invaluable when he not only got Lucious out on bond by bribing the judge, but also got Lucious to record a song from prison and get it on the radio. (No one was less surprised than Cookie, who knows what Lucious is capable of.) I can't wait to see what Andre Royo does with this character, who reminds me of another shady lawyer that I love: Saul Goodman. And how great was that ad hoc recording studio? I don’t know how Thirsty and Lucious found a group of prisoners who know what to do with a soundboard and a beat, but Empire has never been that worried about logic. It very much seemed like an actual music video, with Lucious looking straight into the camera and everything. And Tiana’s dance moves were shot like a video as well. But honestly if the entire hour looked like one giant music video, I might be okay with that. So far, Andre doesn’t want to be a part of starting anything new — he wants what he’s already put blood, sweat, and tears into: Empire. He knows this new enterprise isn't him. Rhonda knows it too, which is why she begs Jamal to take Andre back. She gets Andre on board, but Lucious is, as always, more difficult. Andre was right when he told Lucious that he can't have done anything worse in Lucious' eyes than be gay or sleep with his fiancé, so why is Andre the one son he won't allow back at his company? What Andre doesn't know and what we learn in a flashback is that Lucious' mother also may have showed signs of bipolar disorder (I'm not totally sure what that flashback meant, but to me it indicated Lucious' mom, played by Kelly Rowland, had some mental health issues of her own.) As always, Lucious only wants people on his side that he can manipulate and get something from. Just hold out a little longer Andre, until you have something your dear old dad wants to steal from you, and I'm sure he'll let you back in then. I wouldn’t have suspected it, but Hakeem is showing that he might really have what it takes. Hakeem is demonstrating the good, driven part of Lucious, whereas Jamal is operating like the ruthless, evil part of Lucious. (But maybe those are two sides of the same coin.) Even though his brother and father did their best to make him think about his legacy, Hakeem is thinking bigger than both of them. Hakeem wants to be a music legend in more ways than one: through his rap and through producing new talent. His idea for an all-Hispanic girl group may have some traction at their new company. Cookie names their new business Dynasty because she has the wisdom to know that you can aim high and grow into your name. While she and Jamal are growing into their future roles, Jamal is still growing into Lucious' mini-me. He still has some heart left in him — his reaction when he found out he was going to be an uncle was too sweet — but if he keeps shutting out his family to do Lucious' bidding, his soft heart will only grow harder. Seeing Jamal act ruthlessly has been interesting, but he's at his best when he's trying to prove himself and when he has Cookie by his side instead of Lucious. 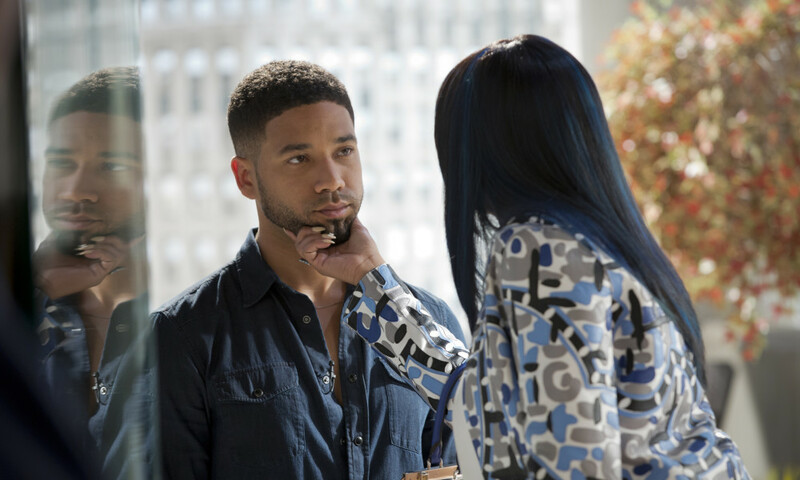 Jamal and Cookie's scene together was great — in part because of the chemistry between Taraji and Jussie Smollett. Jamal's scenes with Cookie have way more chemistry than any of Jamal's scenes with Michael, which is maybe why I'm not super into that couple. But along with an hour-long Empire music video, I would definitely watch an hour of Cookie and Jamal trying to hide their arguments and play nice in a room full of reporters. Empire’s look, much like Cookie’s, is sharper and shinier this season. It looks like the show got a way bigger budget or a way different frame of mind and is much more cinematic and precise. That opening was like nothing ever before on Empire and it was a hoot to watch the montage of the Lyon family on the phone with each other and learning who said what to who, who promised too much, and who was straight-up lying. I love Anika, but what is she still doing with these jokers? I know she wants a job in the music business and has burned bridges with the biggest players, but what in the world would compel a woman to stick around the family that screwed her in multiple ways? Also, I totally don’t blame Cookie for never wanting to see Anika again after Anika slept with her 20-year-old son. Ludacris played a guard in the prison and Lucious’ new enemy, and I am here for it. Hakeem better learn to read his contracts if he wants to run a business. Nothing good can come from him leaking his album online — and telling everyone he did it. Cookie’s best line: “I wanted to tell you first before you hear it out here in the streets. Me, Andre, and Hakeem, we’re starting our own company,” right as the elevator door is closing. Cookie sure does know how to enter and leave a room.